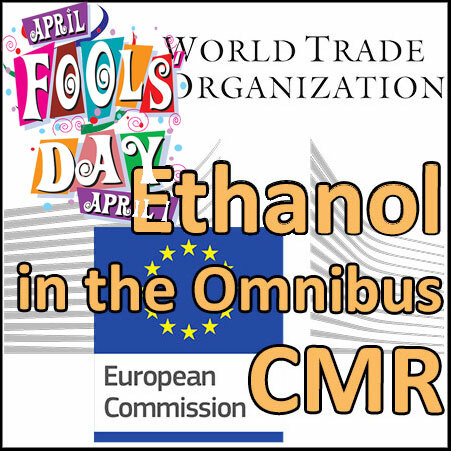 Home Articles Regulation European Commission Ethanol included in the Omnibus Regulation on CMRs… and soon to be banned in cosmetics! On 29 June 2017, the European Union notified the WTO of a draft Regulation to prohibit or limit the use in cosmetic products of all substances classified as CMR. In an addendum dated 27 March 2019, it announced the addition of ethanol to the list of substances soon to be banned in all cosmetic products, including perfumes. This draft Commission Regulation aims at adding Ethanol to substances which have been classified as carcinogenic, mutagenic or toxic for reproduction (CMR) during the period from the adoption of Regulation (EC) No 1272/2008 on classification, labelling and packaging of substances and mixtures to the adoption of Commission Regulation (EU) 2015/1221 on classification, labelling and packaging of substances and mixtures, for the purposes of its adaptation to technical and scientific progress, to prohibit or limit their use in cosmetic products. The substance Ethanol, with the INCI name Alcohol, is currently not included in the Annexes to Regulation (EC) No 1223/2009. Ethanol is currently not classified as a CMR substance, but has been the subject of two classification proposals: Carcinogen Cat. 3 and Toxic for Reproduction Cat. 1. It is also classified as a Carcinogen Cat. 1 by the IARC. On 10 December 2018, the Standing Committee on Cosmetic Products considered that in view of the proven CMR potential of Ethanol, the substance should be banned in all cosmetic products, including perfumes, and adopted this resolution by 22 votes against 6. Therefore, the substance Ethanol should be added to the list of substances prohibited in cosmetic products in Annex II to Regulation (EC) No.1223/2009.